PARIS (JTA) — On the surface, at least, Europe has not changed much over the past 12 months. In fact, when it comes to European politics, this year may appear mild in comparison to 2016, which saw several dramatic and shocking developments, such as Brexit, a refugee resettlement crisis and the terrorist attack in Nice on Bastille Day, France’s national holiday. Across much of the continent in 2017, however, populists were blocked from reaching power by centrist parties. To the relief of the continent’s estimated 3 million Jews and other minorities with bitter memories of extremism, the European Union certainly saw no upsets of the scale of President Donald Trump’s succession of Barack Obama, or that of the liberal prime minister of Canada, Justin Trudeau, over his conservative predecessor in 2015. But a closer examination suggests that 2017 nonetheless has been a watershed year for the continent’s far-right and far-left movements. They have had unprecedented successes in a series of elections thanks to discontent, economic anxiety, nationalistic sentiment and xenophobia. The first upset came in March, when the Dutch anti-Islam Party for Freedom for the first time since its creation in 2006 became the country’s second largest, with 13 percent of the vote. Those elections also allowed the Denk party to enter parliament for the first time in the history of that far-left movement, which was founded by Muslim immigrants on a platform of resistance to integration and which Dutch Jews accuse of anti-Semitism. In December, the Austrian Freedom Party, founded by a former SS officer in the 1950s, for the second time in its history joined the coalition government after garnering 26 percent of the vote in elections two months earlier. In September, the populist Alternative for Germany entered parliament for the first time with its best electoral result ever: 12.6 percent of the vote in the federal election. And in Bulgaria, the far-right Volya party entered parliament for the first time in elections that also saw the successor to the Bulgarian Communist Party double its voters to become the country’s second-largest. But the real shocker came this spring in the two rounds of the presidential election in France, which is home to both Europe’s largest Jewish and Muslim populations. In May, France’s National Front achieved its best electoral result ever when 34 percent of voters cast their votes for the far-right candidate Marine Le Pen in the presidential election won by Emmanuel Macron. Like Le Pen, Melenchon also seeks to take France out of the European Union and has been accused of fomenting racist hatred against Jews. The CRIF umbrella group of French Jews branded him “just as bad” as Le Pen last year. Like nearly all of Europe’s far-right and anti-Muslim parties, the National Front has formally distanced itself from supporters and members who espouse anti-Semitism. But such declarations were generally met with suspicion by Jewish community leaders. In France, where wartime collaboration with the Nazis is still the subject of acrimonious debate, the gains of the far right and far left were widely seen as signs of the breaching of conventions held in place after World War II and the growing polarization in society. To some observers, the growing popularity of the far right even among European Jews is indicative of the scope of the problem. In France, the National Front is believed to enjoy the backing of 13.5 percent of Jewish voters. The party was thought to have had few Jewish supporters before Le Pen took over the party from her father, the avowed anti-Semite Jean-Marie Le Pen, in a bid to rehabilitate its image. In the Netherlands, Party of Freedom leader Geert Wilders polled 10 percent among Jewish voters despite his party’s support for a ban on the ritual slaughter of animals and his 2014 promise to make sure the Netherlands has “fewer Moroccans” – language that many Jews found racist and offensive. Many blame the revival of far-right parties in countries where bitter memories of Nazism had kept such movements at bay on leaders who admitted into the European Union at least 2 million refugees from the Middle East since 2015. Pinchas Goldschmidt, the president of the European Conference of Rabbis, said the far-right renaissance in Europe “is a counterreaction” to the pro-refugee policies of German Chancellor Angela Merkel, who took the lead in welcoming the immigrants. “Strategically she did the right thing, but technically she might have made a mistake,” Goldschmidt, a frequent and fiery critic of Europe’s far right, told JTA. Germany’s negative birth rate and growing need for working-age citizens “explains why Merkel wanted to open the gates, but short term it created tremendous amount of troubles for her, her party and moderate forces throughout Europe,” he said. The rise of the far-right Freedom Party to power in Austria “is a backlash against Merkel’s policy,” Goldschmidt said. He said it has gained strength amid growing fears of Islamist attacks in Europe and tensions connected to failures in the integration of second- and third-generation Muslim immigrants. Meanwhile, Goldschmidt added, the issue is taxing the already uneasy relationship between the western and eastern components of the European Union. 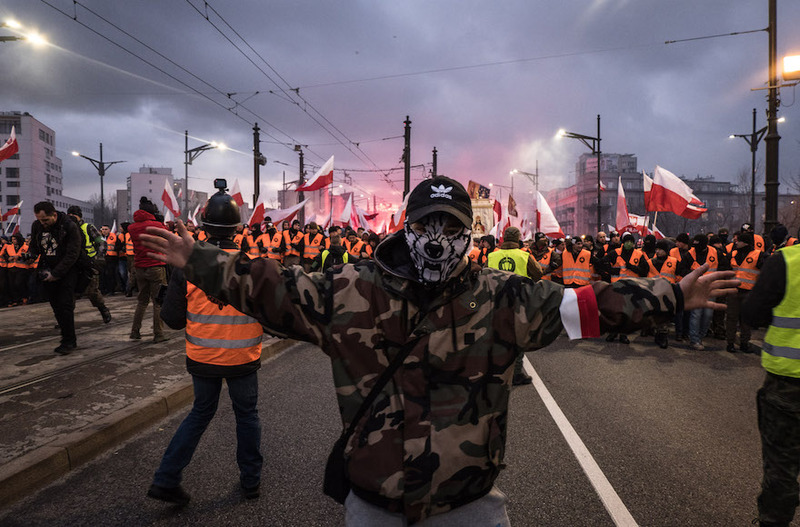 Fears of Muslim immigration this year were a main theme at one of the largest nationalist rallies in the recent history of Central Europe: On Nov. 11, some 60,000 people attended a march in Warsaw that featured anti-Muslim banners and anti-Semitic chants. In nearby Hungary, the rightist government placed the immigration issue squarely at the center of a campaign against the Jewish and pro-immigration billionaire George Soros, which some critics said had anti-Semitic overtones. Fear of Russian expansionism under President Vladimir Putin is further exacerbating the ultranationalist problem in countries with bitter memories of life under Russia’s rule, Dominique Reynié, a political science professor and founder of the Paris-based Fondapol think tank, noted at the CRIF event. But that threat, along with radical Islam, is also having therapeutic effects on the ailing European Union and may be key to its survival, Reynié added.